A collection of 7 Celtic / Folk inspired original pieces for intermediate to advanced flute players. 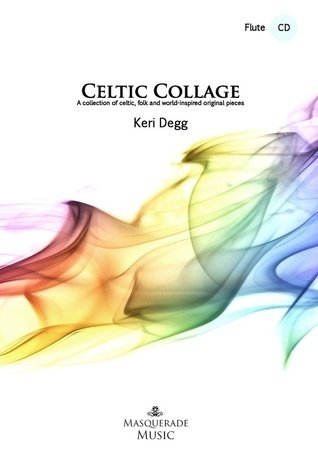 Written by UK composer Keri Degg in 2012, Celtic Collage is an exciting collection of seven original pieces for flute and backing tracks (also includes a pull out piano accompaniment part). The collection is aimed at grade 6+ level players. The CD contains both full demonstration, and accompaniment tracks with enhanced backing (with additional Celtic style istruments such as Celtic harp and fiddle). From laments to lively jigs, there's plenty of choice, and as the composer is herself a flautist, the pieces are written in a thoughtful and sensible way. Two of the pieces currently feature on Trinity College's Graded Flute Syllabus at Grades 4 and 5. The demonstration, and backing tracks contain extra sounds such as Celtic harp and percusiion in addition to piano for an enhanced practice experience. Here are two audio samples from the collection; 'Celtic V' , a complete audio track, and also Celtic Collage medley containing all 7 excerpts from the collection. Free UK P&P on pre orders of this book (limited time only!). Click play (triangle button) on the Soundcloud player below or click these links if the Soundcloud players are not visible on your device; 'Celtic V' audio and Medley of excerpts from Celtic collage. "Keri Degg's Celtic Collage offer something different. Here we have seven original compositions which are both melodically interesting and accessible while not technically too demanding. There is therefore an appeal to a wider cohort of players within the classically trained fraternity. The CD is interesting and illustrates the variety of sentiment inherent in the music. The softer flute tone fits well with the aesthetic sense of the writing. The use of timbral trills and notes fading is a nice addition, enhancing atmosphere and opening the window towards greater possibilities, while pointing up a relative silence. Happily those ornamental devices are not overused as can sometime be the case. In piece VII, the use of different compound times combined with a seven bar structure keeps the metronome guessing and forms a rhythmic pattern. It is refreshing to see traditional music in a setting free from shawls, thatched cottages, or well known alcoholic beverages"......."a player of around grade 6 level, with a few pointers on extended techniques, will find all of the material throughout the publication very playable. .......provides an entertaining and useful introduction to the Celtic genre for those with an interest". Tom Greene. Overseas customers (or indeed those just liking a bargain!) may like to consider our PDF / MP3 email delivery option which are usually delivered to your inbox within 24 hours of order. Please note that if you reside in France, we can highly recommend our stockist; Musique Egele, in Colmar for distribution of Celtic Collage (and other Masquerade Music publications). Follow this link to order Celtic Collage from Musique Egele, France. Bb Clarinet/Saxophone, and Eb Saxophone editions are also available.